Carrot salad is a salad made with carrots. Recipes for carrot salad vary widely by regional cuisine. Shredded carrot is often used. Shredded carrot salads are often used as a topping for other dishes. 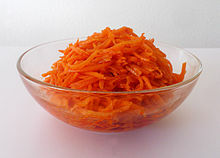 The Koryo-saram, ethnic Koreans in the post-Soviet Union states, popularized spicy pickled carrot salad, known throughout the Soviet Union as Korean-style carrots. It is said to have been unknown in South Korea until recently, but has gained an international following and is served in many cafeterias throughout the CIS where it is also sold in supermarkets, and featured regularly as a side dish on dinner tables and at holiday feasts set by many ethnicities of the former Soviet Union. In India, carrot salads are often made with grated carrots are cooked with mustard seeds and green chillies in hot oil. In Bulgarian cuisine a salad with carrots and cabbage is traditional. In Brazilian cuisine, churrasco service often includes potato salad and carrot salad made with mayonnaise, raw onion, green peas, sweetcorn or sometimes chayote squashes. Houria is cooked carrot salad in Tunisian cuisine. In Russia, doner kebab often includes carrot salad as an accompaniment to the meat. Surówka z Marchewki is a Polish cuisine carrot salad made with carrots, Granny Smith apple, lemon juice, sunflower oil or vegetable oil, salt, and sugar. Carrot salad is eaten in Israel with parsley and lemon juice. Macedonia is a dish that was represented in the 1940s and 1950s in north Africa and Québec (Québec City especially) with cans "de la macédoine" of diced carrots and peas. Wikimedia Commons has media related to Carrot salad. ^ "Carrot Salad - Carrot Salad Recipe with Shredded Carrots and Raisins". Southernfood.about.com. Retrieved 2013-07-19. ^ Andrei Lankov (2012-08-21). "Korean carrot | Russia Beyond The Headlines ASIA". Via.sawd.ch. Archived from the original on 2013-09-28. Retrieved 2013-07-19.